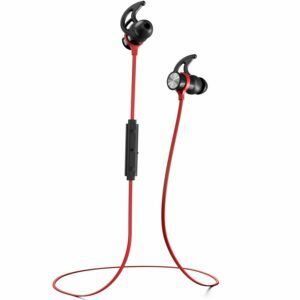 Looking for a cheap pair of sports Bluetooth in-ear headphones for your workout sessions? Take a few minutes to read our review of Creative Outlier ONE Bluetooth in-ear headphones. These simple Bluetooth earbuds could be the right thing for you. Founded in 1981, Creative has more than 30 years of experience in making very good and very affordable digital entertainment equipment (PC and gaming equipment, speakers, headphones, etc.). Creative Outlier ONE in-ear headphones are one of the latest Creative’s products and one of the cheapest Bluetooth headphones ever made by Creative. Don’t let the price fool you – they are cheap but that doesn’t mean they are bad. Bluetooth earbuds were much more expensive a decade ago but you can now find a pretty decent and quite durable pair of in-ear headphones for less than $30. Creative Outlier ONE earbuds feature very common behind-the-neck design. They are light and comfortable for long listening sessions. 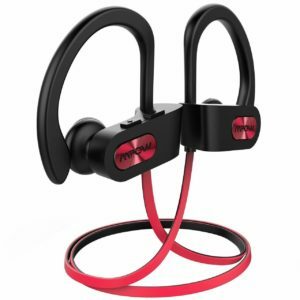 They feature IPX4 splash-proof/sweatproof rating which is good enough for any kind of sports activity (gym workout, running, cycling, climbing). Creative Outlier ONE headphones deliver an impressive playtime (more than 9 hours at 50% volume) and provide pretty reliable Bluetooth connection. We were not amazed by the sound, but you could never get a perfect clarity and an impressive amount of detail from a pair of cheap in-ear headphones. You will get good clarity at low volumes. There’s a clear emphasis on the bass frequencies (around 100Hz). The sound becomes a bit bassier at higher volumes, but it’s not too heavy and it doesn’t put too much shadow on the low midrange. When it comes to downsides, the only thing that we didn’t like was the mic performance. It’s below the average. You can hear the person talking to you loud and clear but your voice will sound a bit muffled and echoey. It’s good enough if you have to answer/make a call and say a few words but it’s not good enough for long conversations. For the price, Creative Outlier ONE in-ear headphones deliver very good performance. Are they great-sounding earbuds? No, they most definitely are not. Are they incredibly durable? We don’t think so. Creative Outlier ONE are simple and easy-to-use in-ear headphones. They are solidly built and are IPX4 certified (splash-proof and sweatproof) which makes them suitable for workouts. Like many other sports earbuds, their sound signature is on a bassy side (but not too heavy). Creative Outlier ONE headphones deliver above-average playtime and have a reliable Bluetooth connection. All in all, finding better performance at $25 price tag will be a difficult task. Creative Outlier ONE in-ear headphones come in a surprisingly good-looking box (considering the price). It’s not premium, but the presentation is really nice. Inside the box, you will find your in-ear headphones, 3 pairs of silicone tips in S, M, and L sizes, 2 pairs of secure tips (in-ear wings) for better stability, one carrying pouch, micro USB charging cable, one shirt clip, user manual, and 1-year warranty. Creative Outlier ONE in-ear headphones have the same kind of behind-the-neck design like many other sports Bluetooth earbuds. There’s a flat tangle-free 1.64ft long cable connecting two plastic earpieces. There are three-button inline controls with a built-in mic on the right end of the cable, 4in away from the right earbud. The earbuds feature a familiar angled design which is supposed to provide better comfort and seal (and, consequently, better bass response). The cable is rubberized and feels sturdy. The earpieces are mostly made of plastic and then wrapped in silicone for additional protection. Some people might find this kind of design a bit boring. There’s nothing flashy or really noticeable that would make these earphones distinctive, but if you are a simple person looking for a simple pair of earphones, you will actually like this kind of design. Our expectations were pretty low, mostly because of the price but, Creative Outlier ONE in-ear headphones proved to be quite feature-rich. You have a very good battery, pretty good build quality and IPX4 rating, reliable Bluetooth connection, inline controls, and a built-in mic. Not bad for a cheap pair of headphones. Creative Outlier ONE are super-light. They weigh only 0.53 ounces. The earpieces look a bit bulky but they don’t put any noticeable weight on your ears. This is one of the most important things when it comes to comfort. The second and third important things affecting comfort are fit and stability. More expensive earbuds come with more different pairs of tips and wings. With these headphones, you will get 3 pairs of silicone tips and two pairs of in-ear wings. That should be enough for most people. If you want something even more comfortable, you can buy a set of foam tips separately (they are not included in the package). The earbuds are compact and feel quite sturdy. They are made of plastic don’t look that cheap or flimsy. 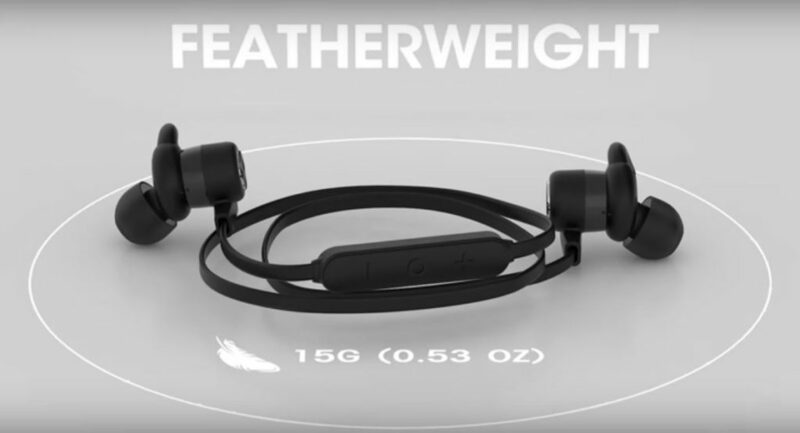 Creative Outlier ONE headphones are IPX4 certified which means they are splash proof and can withstand heavy sweating. That kind of IPX rating should be enough for any kind of sports activity. One of the greatest highlights is the battery. It has the capacity of 150mAh and the advertised playtime is 9.5 at 50% volume. Creative Outlier ONE headphones feature Bluetooth 4.1 with a standard 33ft range. There are no advanced Bluetooth features and you shouldn’t expect them at this price point. So, there is no NFC quick pairing and no multipoint pairing (you can’t pair two smartphones with these headphones simultaneously). There’s a built-in mic on the back side of the control pad. 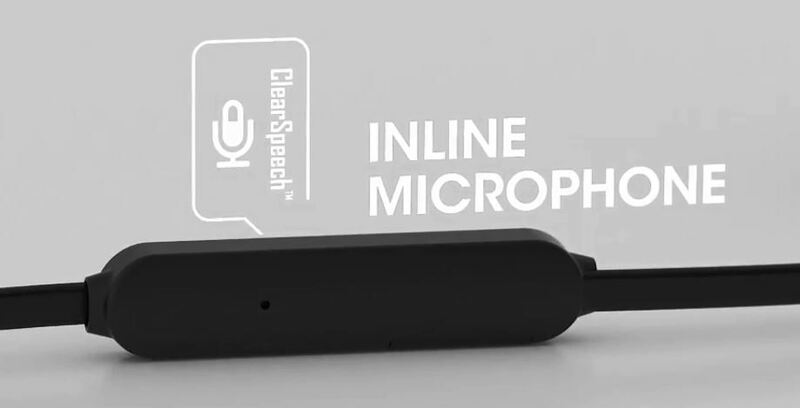 The mic features ClearSpeech technology which is supposed to enhance voice clarity but we were not impressed by the mic performance (read the next section to find out more). Built-in controls are quite simple and easy to use. You have three buttons and they are all multifunctional. Also, you have one LED status indicator right next to the Volume Down button. Volume Up button is also used to skip forward (long press) and Volume Down is used to skip backward (long press) or to mute the microphone. The middle button is used to play/pause songs and answer/end calls. We’ve had no issues when it comes to durability. Outlier ONE can really withstand heavy sweating. They didn’t show any weaknesses during our testing period (which is usually 5-7 days). They are not super-rugged and we don’t expect them to last for years but, based on our experience, they do feel capable and solid enough to survive one year or everyday use. That’s basically all you should expect from any cheap pair of headphones. The earpieces and silicone tips look a bit bulky but they are actually very comfortable and we didn’t have problems finding the right pair. Still, we have tried them with our own set of comply foam tips and they did feel better (more natural and better isolation). Both silicone and foam tips combined with silicone in-ear wings provided great stability. One slightly annoying thing was the cable. It’s really long and it dangles up and down when you’re running or jumping. You can use the included clip to attach it to your shirt and prevent it from dangling. The controls are simple. All the buttons are responsive and easy to reach. They are maybe not raised/tactile as much as we would like them to be but that wasn’t a big issue. The battery delivers 9 hours of playtime (on average). It’s pretty close to the advertised 9.5 hours and we don’t have any major complaints. You will get approx. 3 hours at full blast. The recharge takes up to 3 hours. Bluetooth connection delivers decent performance. It’s not above average, but it’s satisfying. You will get a standard 30ft range (within the line of sight) or 15-20ft indoors. There was no any dropout or signal loss within the 15ft range. One thing we are not happy about is the microphone performance. The microphone is not awful and it’s not completely unusable but it’s also not great. You can hear the person you’re talking with perfectly, but there is some kind of echo on the other end. The mic tends to muffle your voice from time to time and make it less intelligible. The sound quality exceeded our expectations. This is not an audiophile gear in any way – it only sounds pretty good considering the price. We always have the prejudice against cheap earbuds and that’s not completely unfounded but they are really becoming better. The lows are emphasized, especially the frequencies around 100Hz. At low volumes, the bass is punchy and impactful but doesn’t affect the low midrange and doesn’t put any shadow on vocals. The situation changes at high volumes. The bass kind of gets out of control and it overpowers the midrange and muffles the vocals. The bass is not super-heavy but it’s safe to say that Outlier ONE are bassy earphones. The highs are clear and detailed at low volumes but become a bit intense (not harsh or ear-piercing) at high volumes. When it comes to other sound-related characteristics, everything is pretty much on par with the price. The soundstage is narrow and the imaging is not very accurate. Whenever some complicated orchestral music was playing, everything sounded jumbled up. The number of cheap sports Bluetooth earphones under $30 is surprisingly high but they are not all great. There’s a lot of generic and crappy brands, but there are also some trusted choices. Here are three viable alternatives. We have previously reviewed Anker SoundBuds Slim+, and if you want to find out more about these earphones, you should read our detailed review. Soundbuds Slim+ feature the same kind of around-the-neck design with 3-button inline controls. They are just a few bucks pricier than the Creative Outlier ONE. They are both priced under $30. Soundbuds Slim+ earphones come with more accessories (3 pairs of in-ear wings, 4 pairs of silicone tips, and hard zippered case). In terms of performance, the difference between the two models is not huge. Anker features higher IPX rating (IPX5 VS IPX4 = water resistant VS splash-proof). They both provide great comfort and stability. 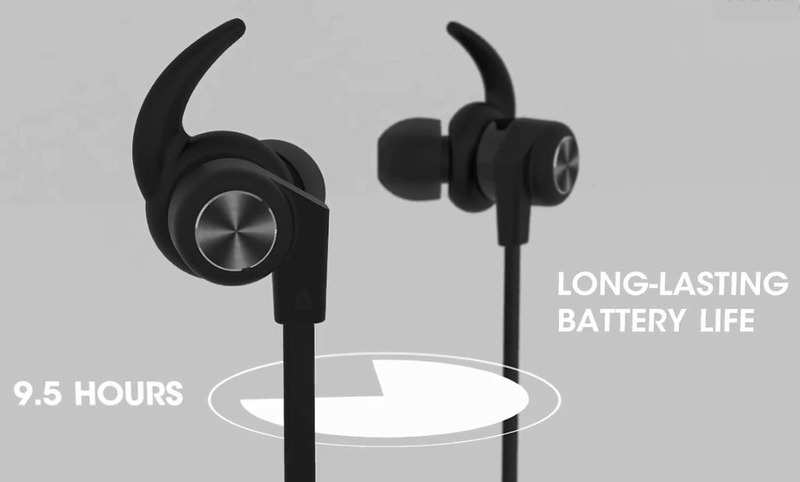 When it comes to battery life, Outlier ONE earphones have the advantage (9 hours VS 7 hours). Both models have a bassy sound signature. SoundBuds Slim+ earphones deliver a little bit clearer mids and vocals. Phaiser BHS-730 in-ear headphones also feature the same kind of design. They are a few bucks pricier than the Outlier ONE but the price difference is not significant. BHS-730 earphones, just like SoundBuds Slim+, come with more accessories (3 pairs of in-ear wings, 3 pairs of silicone tips, 1 pair of foam tips). 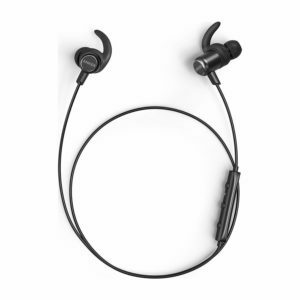 They both provide great stability, but we don’t like those in-ear wings that come with BHS-730. They feel less comfortable than the Outlier ONE wings. BHS-730 in-ear headphones are sweatproof but they are not IPX certified. On the other hand, Outlier ONE earphones are IPX4 certified. 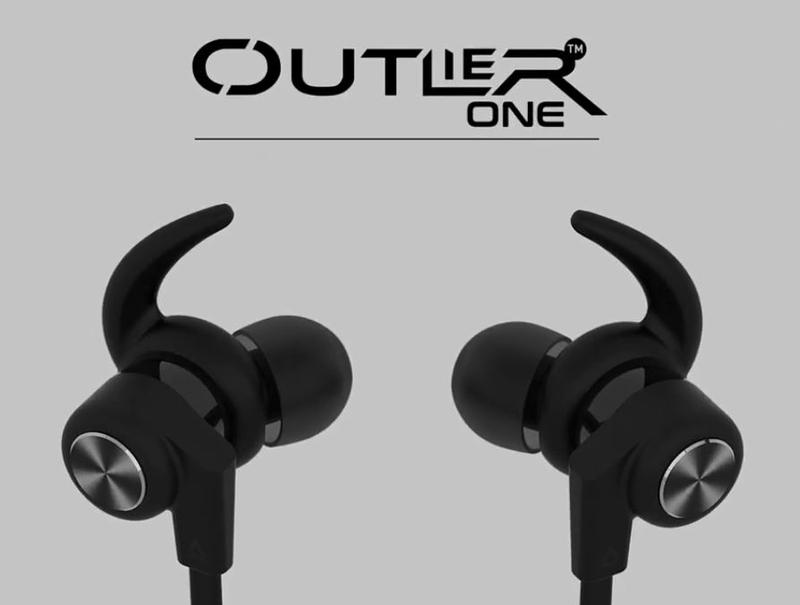 Outlier ONE in-ear headphones have a larger battery and deliver longer playtime than BHS-730 (9 hours VS 8 hours). BHS-730 are also bassy earbuds. They deliver a little bit cleaner sound than the Creative Outlier ONE. If you don’t like in-ear wings, you might like Mpow Flame earbuds. They also have the same behind-the-neck design but they have over-ear hooks instead of in-ear wings. Mpow Flame earbuds are a priced under $20 (cheaper than the Creative Outlier ONE). Mpow Flame earbuds come with 3 pairs of silicone tips, 1 pair of foam tips. Those over-ear hooks are undetachable and they are supposed to fit all ears (that doesn’t seem right). We are not fans of hooks and don’t find them as stable as in-ear wings but they might fit you. In our experience, you will get better stability and fit with in-ear wings. Mpow Flame earbuds are fully waterproof (IPX7 certified) while the Outlier ONE earbuds are splash-proof (IPX4 certified). Creative Outlier ONE earbuds have a larger battery (150mAh VS 110mAh) and deliver longer playtime (9h VS 8h). Mpow Flame earbuds deliver bass-heavy sound just like Outlier ONE. They are not as loud as Outlier ONE. Creative Outlier ONE Bluetooth in-ear headphones deliver pretty good value for the price. They deliver longer playtime than most of the other earbuds within the same price range, they feel solid and can withstand heavy sweating (IPX4 certified). If you are on a budget and looking for a cheap pair of sports Bluetooth earbuds with bassy sound signature, Creative Outlier ONE could be just the thing you need. When you write reviews for some Sony earbuds? We have absolutely no idea at this moment. If something interesting comes up, we are going to review it. Just one question. Creative Outlier Sports or Creative Outlier ONE? What’s the difference in the sound quality? Outlier Sports deliver better sound quality thanks to aptX support.They also come in more versions and with more accessories.